Upgrade your WorkFit-S or WorkFit-A workstation with a tray designed to allow the keyboard to drop below table height in a corner work space. Installs centered or offset to the right or left side to accommodate user preference. Clipped corners of tray allow WorkFit to be used in bend of L-shaped worksurfaces. Extra deep dimension provides more space for peripherals than standard tray. Installs centered or offset to the right or left side. 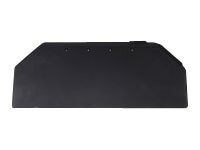 Option to mount the keyboard tray further out (up to 4.4"/11.2 cm) to increase the horizontal distance from the keyboard to the display area (WorkFit-S only). Max weight capacity of 5 pounds.